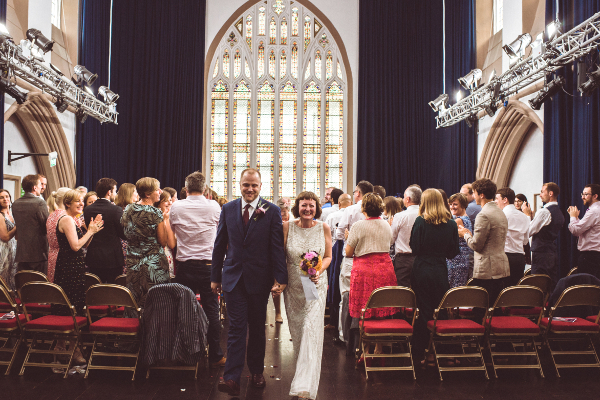 Trinity is the perfect space for your alternative, grass-roots, DIY wedding. With our central location, affordable packages a choice of indoors and our lush green garden – you can celebrate your special day in one location. Clare and Dave booked Trinity for their wedding, here they walk down the aisle in Fyfe Hall (image courtesy of Clare and Dave). Host your ceremony in the beautiful Fyfe Hall with breathtaking stained-glass windows; transform the main hall with your own vision into a decorated banqueting area; make the most of the iconic backdrop for photos in-front of the recently restored Grade II* listed former church, The Trinity Centre. 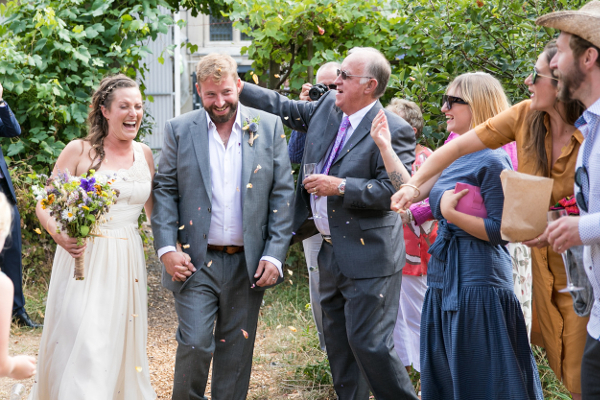 Abi and Jack celebrate their marriage in Trinity's large outdoor garden (image courtesy of Abi and Jack).